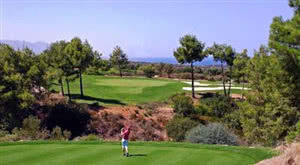 The Korineum Golf & Country Club built on the north side of Cyprus, opened in 2007. This is a 5* resort which offers a wellness centre, gymnasium, swimming pool, resturants and roof terrace (overlooking the 18th green) as well as the 18 hole championship length golf course (6232 metres off the back tees). The course is reasonably open, but by no means easy. The rolling, tree lined, green fairways are punctuated umbrella pines and olive trees and the large greens protected by numerous strategically placed bunkers and water hazards. But, although a tough course from the back tees the use of multiple tee options (usually five per hole) mean that this course can be enjoyed as much by the average golfer as by the scratch player. The course is always beautifully maintained, and the views from some of the holes are simply fantastic. The course is in Turkish northern Cyprus, so is not the quickest to travel to - 4.5 hours on a plane then 1.5 hours in a bus, not the best. But when you actually get to see the course in the cold(very warm) light of day, then it becomes worth it. Looking out of the hotel windows onto the course, the backdrop is the view of the Troodos Mountains, which for most of the stay were shrouded in clouds, but it's a beautiful view all the same. The course is much as you would expect all around the Mediterranean - fluffy Bermuda, sandy soil, bunkers with real sand, plenty of trees, some water and scrub areas around the edges. The course is not simple to play, but it is not unplayable for a higher handicapper. There is a lot of variation, dead straight shortish par 4's - but that does not mean easy, short par 3's, but then factor an elevation change and relatively short par 5's which should be easy, but won't be. A course to use your brain when playing, which is why I only had one decent round (brain left in UK)!! As soon as the Turks and Greeks dismantle the border, and we are allowed to fly directly to the north of the island, it will be a pleasure to return. And that is the only thing that would make me think before rushing back.